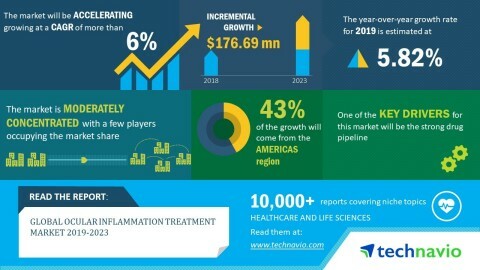 LONDON--(BUSINESS WIRE)-- Technavio analysts forecast the global ocular inflammation treatment market to grow at a CAGR of more than 6% during the forecast period, according to their latest market research report. The growth momentum of the market is expected to accelerate in the year-over-year growth. Technology advancement in drug delivery is one of the major trends being witnessed in the global ocular inflammation treatment market 2019-2023. The lack of advanced drug delivery methods is one of the major challenges faced by the ocular inflammation treatment market. The delivery of the drug into regions such as the middle layer of the eye is a highly complicated and painful method. Hence, the increasing need for technology advancement and novel drug delivery systems has led to the advent of small hair-strand size devices that can be implanted in the middle layer of the eye. Thus, such advances in novel drug delivery and technology advancement are attracting more patients due to the huge number of benefits associated with treatment and are expected to drive the market. Despite various therapies being approved for the ocular inflammation treatment, the market still has a huge unmet need which indicates towards the requirement of a strong drug pipeline. Hence, various pharmaceutical and biotechnology companies are conducting research on the development of impactful drugs. Thus, the strong drug pipeline for ocular inflammation treatment along with expected new approvals is expected to contribute to the market growth during the forecast period. The global ocular inflammation treatment market research report provides market segmentation by product (corticosteroids, immunosuppressants, anti-infectives, and other drug classes) and by region (the Americas, EMEA, and APAC). It provides an in-depth analysis of the prominent factors influencing the market, including drivers, opportunities, trends, and industry-specific challenges. The Americas held the largest share of the market in 2018, accounting for close to 44% share. It was followed by EMEA and APAC respectively. The dominance of the Americas can be attributed to the strong drug pipeline and growing awareness of eye care.